Biography of Dutch Realist Painter, Dordrecht School. One of the most innovative of Dutch Realist artists of the Dordrecht school, Samuel van Hoogstraten was - like Carel Fabritius (1622-54) and others - a student of the great Rembrandt (1606-69). Van Hoogstraten lived in Vienna, Rome and London but returned to settle in his native town of Dordrecht. A writer and poet, as well as a painter, he was appointed provost of the Dutch mint. He is best known for his perspective peep boxes like A Peepshow with Views of the Interior of a Dutch House (c.1655-60, National Gallery, London) and his architectural perspective interiors such as The Slippers (1662, Louvre, Paris), View Down the Corridor (1662, Dyrham Park, UK). A great exponent of Dutch Realist genre painting, he also painted trompe l'oeil, a form of illusionist painting, as well as portraits and still-lifes. One of his greatest contributions to the history of art was his treatise: Introduction to the Advanced School of Painting: The Visible World (1678). Although his theoretical works are regarded as superior to his practical art, he remains one of the great exponents of Dutch Realism, and ranks alongside Willem Kalf (1619-93), Gabriel Metsu (1629-67) and Pieter de Hooch (1629-83). Greatest Dutch still life painter. Van Hoogstraten was born in Dordrecht, Holland in 1627. His father was an artist, and taught his son the skills of drawing, sketching and printmaking. In about 1640 van Hoogstraten moved to Amsterdam and entered the school of Rembrandt van Rijn (1606-69). Rembrandt is considered by art experts to be one of the greatest painters and printmakers of Northern Europe, and his contribution to art was in a period known as the Dutch Golden Age. The primary subjects he taught in his workshop were portraiture, landscape and narrative painting. His workshop was busy, and his pupils numerous. It was visited by the rich from far and wide who, if not able to purchase an original oil painting by Rembrandt, may at least acquire a copy in his style. Van Hoogstraten was in the company of other great artists of his day, including Carel Fabritius, Gerbrand van den Eeckhout (1621-74), Heiman Dullaart (1636-84), Gerrit Dou (1613-75), Nicolaes Maes (1634-93) and Willem de Poorter (1608-68). When he finished his apprenticeship at Rembrandt's studio, Van Hoogstraten became an official Master and Painter. Van Hoogstraten experimented in different styles and genres, including portrait art (which is generally viewed as his least strongest area). An example is Portrait of Johan Cornelisz. Vijgeboom and His Wife (1647, private collection), which depicts a couple holding tulips in their garden. In the 1660s he painted The Anaemic Lady (Rijksmuseum, Amsterdam), an ailing young woman sitting in a domestic scene. Her doctor stands beside her examining a flask of her urine, as another man, perhaps her husband looks on. The sitters are evidently wealthy, surrounded by paintings and costly furnishings. In Van Hoogstraten's Two Women by a Cradle (1670, Museum of Fine Arts, Springfield) we view an intimate sensitive scene that displays the fine brushwork and chiaroscuro effects of the artist's teacher Rembrandt. Popular in Holland in the 1600's, Van Hoogstraten created a number of peepshow paintings, only a few of which remain today. 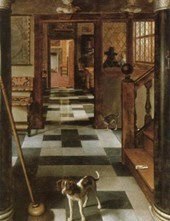 A fine example is his Peepshow with Views of the Interior of a Dutch House (c.1655-60) at the National Gallery, London. The peepshow is a rectangular wooden box with an interior of a Dutch house painted on three sides. Originally light would have entered the box from the side, perhaps through a specially treated piece of paper. The box would have been placed near a window, or candle. Two peep holes appear on the two shorter sides of the box, and if looked through, give the impression of a 3D view of the interior of the house. Van Hoogstraten's box at the National Gallery is particularly captivating, and in exceptional condition. The subject matter in the painting is endowed with allegorical meanings, concerning love, art and fame. See also Protestant Reformation art (c.1520-1700). The use of linear perspective in a painting creates the illusion of 3-D space on a 2-D picture surface. Subjects in the background appear smaller as a result, than those in the foreground. The 'single point' system of linear perspective was pioneered by Filippo Brunelleschi (1377-1446) in Florence who employed the technique in relation to architecture and paintings. He created the first recorded painting which uses geometric optical linear perspective in about 1425. This was his two panels for the Florentine Baptistery. The panels were constructed with a hole drilled through the central vanishing point, so that when viewed, all lines appear to converge towards a single vanishing point. Dutch painters used the pictorial version of this technique from the early 16th century, using single vanishing points in their paintings as points of reference. In Van Hoogstraten's view of the Vienna Hofburg (c.1652), he employs the same technique with great skill. For other Dutch painters renowned for their mastery of single point perspective, see Emanuel de Witte (1615-1692) and the even more accurate Pieter Saenredam (1597-1665). But Van Hoogstraten's fame derives primarily from his literary works, rather than his fine art painting. In 1678 (just before his death) his treatise Introduction to the Advanced School of Painting: The Visible World, was published. This was one of the most ambitious treatises to be written in Northern Europe to that date. It covers pictorial discussions, the painter's moral views in relation to painting and philosophy, and references modern and antiquarian authors. Although written years after the death of Rembrandt, the treatise makes innumerable references to his views and teachings. As a reference document, it provides an invaluable contribution to art history. Van Hoogstraten died in 1678 at the age of 51. Paintings by Samuel van Hoogstraten can be seen in some of the best art museums in Europe.